On the scene in London, we spoke to local shop owners about the big event. 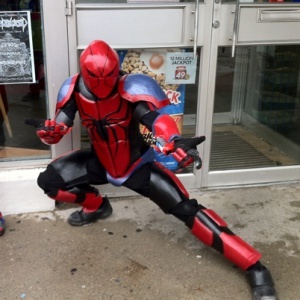 There's two unofficial rules when it comes to celebrating Free Comic Book Day in London, Ontario. Rule #1: Go to Heroes first. Rule #2: If you don't want to wait in line, go early. At 7:30, the line will be firmly established just outside the doors, and it will have stretched down the block and around the corner by 9:00. Even after opening, visitors can expect to wait anywhere from 30 minutes to 2 hours before finally clearing the line and reaching the entrance. But once you've picked up your free books, it's not time to go home: London is home to another four comic shops, working together to turn downtown into a pilgrimage destination for geeks and fans. "We've watched it grow through the years, but honestly it's been at a monstrous size for the last 5-6," said Heroes proprietor Brahm Wiseman. "We're essentially above capacity ... we service it as very best as we can but it's such a monster that draw is almost bigger than what we can handle." Wiseman quickly added that the numbers aren't a complaint. "We try to make that part of the fun and part of the event," he explains. Staff members often put on costumes and walk up and down the line, entertaining the crowd while handing out candy or bottled water. In many cases, they'll find their enthusiasm mirrored by costumed customers, prompting multiple photo opportunities throughout the day. Meanwhile, London's usual downtown commuters walk or drive by with amazed looks on their faces. Perhaps a few join the line themselves, but with the line's end out of sight it's difficult to tell. Free Comic Book Day first began in 2002, when North American publishers and retailers teamed up to distribute free issues to generate interest in the comic book industry. Not all communities take part quite like London however, with four comic book shops on Dundas St and a fifth just around the corner on Richmond. On Free Comic Book Day, each store gives away "Comic Shop Crossover Passports" which can be stamped each location you visit. Completed passports are turned in at your final stop to be entered in a massive prize draw for hardcover graphic novels, statues, tabletop games, and more. At first, each store ran Free Comic Book Day independently, relying on individual strengths to attract customers. Heroes is the largest of the five, with an estimated availability of half a million comics that encompasses everything from mainstream books to obscure indie titles. LA Mood has a modest selection by comparison, but certainly makes up for it with tabletop games, RPGs, and Magic card sales. Worlds Away boasts London's largest back issue collection, all contained in boxes that take up a significant portion of floor space. Neo Tokyo focuses exclusively on manga and anime sales and, with the exception of stores in Toronto, is the only store in the region that doing so. But none of these are even the oldest stores gracing London's streets; that honor goes to The Comic Book Collector, which has operated since 1979 with the support of loyal followers and their children who visit to this day. That all changed thanks LA Mood's Carol Vandenberg and her non-comics hobby: quilting. Businesses that provide quilting supplies often come together to host "quilt shop-hops" that transport customers from store to store, and Vandenberg saw a similar opportunity in London's comic book scene. "I thought 'Ohhh this would really work for Free Comic Book Day!'" Vandenberg explained. "I proposed it to a customer who frequents all the stores, he asked if anybody was interested ... and we went from there. "I think it was one of my former employees who said 'Oh like a comic shop crossover!' and I said 'Yeah that's it!'"